Ants are a part of life no matter where you live. They can range from simple nuisance ants that invade your kitchen, to carpenter ants that can cause major damage to your house, or even painful stinging swarms of fire ants. With over 1,000 different species of ants in North America, there is no “one solution” to rid your house of them. Here we will cover the over-the-counter and natural remedies one can use at home. If you find yourself overwhelmed, the experts suggest reaching out to a local university’s Cooperative Extension or contacting a professional pest management service in your area. 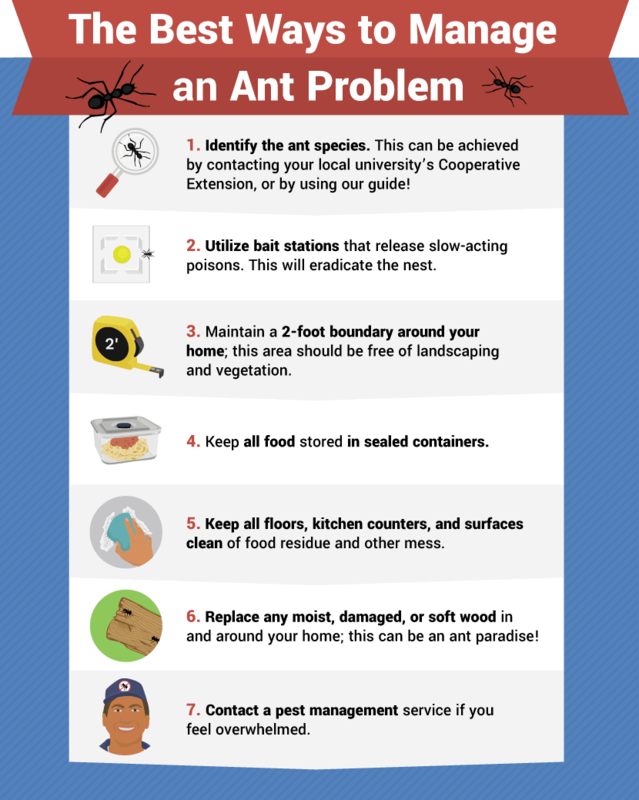 Before we get too in-depth, here’s a quick ant removal checklist you should consult when you notice an ant problem. Size: ¼ to ½ inch long. One of the largest species and easiest to spot. Nest Locations: Prefer living, standing trees. Will also nest in soft, moist lumber or logs. Food: Will scavenge for a broad range of food. Plant nectar, meat, honeydew, seeds, sugar, and other insects. If you find carpenter ants nesting in your home, it is often a sign that you have had or have a water leak that caused damage to a section of wood within your home. Carpenter ants prefer not to nest in or destroy dry lumber, but will happily move into that area should a termite or wood beetle nest be present. Replacing the damaged wood should remove the carpenter ant problem if other pests are not present. Also Read : Why Cleaning an Empty House Cleaning Takes More Time? 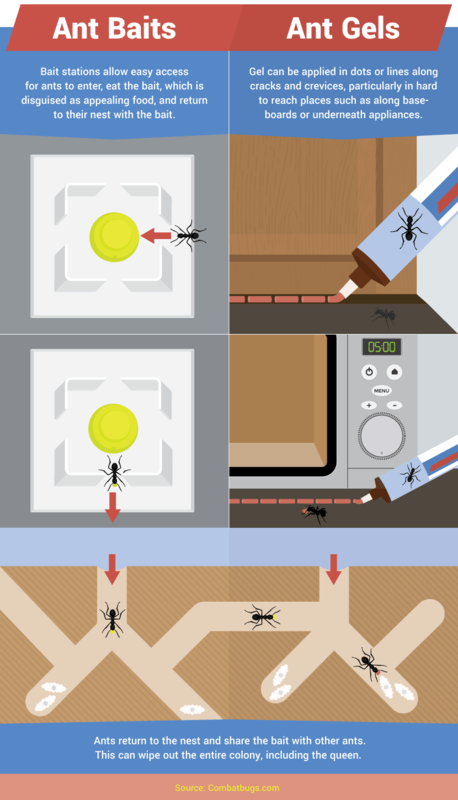 Removal and Control: Locate the nest by observing the ants’ movement. Use baits or sprays to destroy the nest and replace damaged wood to prevent future infestations. Nest Locations: Outdoor soil; under stones, logs, or any cover. Will also nest indoors under sinks, insulation, dishwashers, walls, floor voids, and moist warm areas. Food: Sugary foods, dead insects, and meats. They are named “odorous” due to the coconut smell they create when crushed. If you only find a few wingless ants in your house, chances are the nest is located outdoors, and they are only coming in for your food. If you see winged ants or constantly see a large number of wingless ants inside, the nest is likely in your house. Removal and Control: Monthly treatments with baits and sprays may be necessary. Keep food sealed, clean countertops and home regularly. Contact a pest management company if you feel overwhelmed. These little guys are considered the warriors of all ant species. They may be small, but they can take out a colony of red ants. Nest Locations: Anywhere dirt can be found. Around and under bricks and pavement. Grassy areas and even extreme areas like salt marshes. Introduced here from Europe, they are not native to the Americas. Food: They are opportunistic eaters. Will dine on anything from dead insects to pollen and food in your kitchen. Removal and Control: Use over-the-counter baits and barrier sprays to keep ants at bay. If found in-house, clean up any leftover food remnants. Note: They do not bite or sting. These ants are generally found in dry desert areas and prefer loose to gravelly soil to build their nests in. Nests can be rather large underground, with some found to be over 5 feet deep. These ants feed on seeds and generally won’t enter or cause damage to homes. Their main threat to humans is if you happen to stand on the nest, causing them to swarm and sting you. This species of ant is native to South America and is considered an invasive species in North America. They reached American shores sometime between 1933 and 1945, most likely by being sucked into the ballast tanks of ships leaving South America and then emptied here. There is certainly no shortage of commercially available ant products available at your local home goods store. The number of options out there can be overwhelming, but they fall into six distinct categories of treatment methods: baits, contact sprays, perimeter sprays, foggers, glue traps, and lawn treatments. Each manufacturer uses a slightly different chemical formula for its ant poison, but just about all are highly effective. It’s a good idea to take note of the brand/chemicals you use so you can either stay with that option for continued success or try something new. Important: Read all manufacturers’ warnings and their application guide before use. 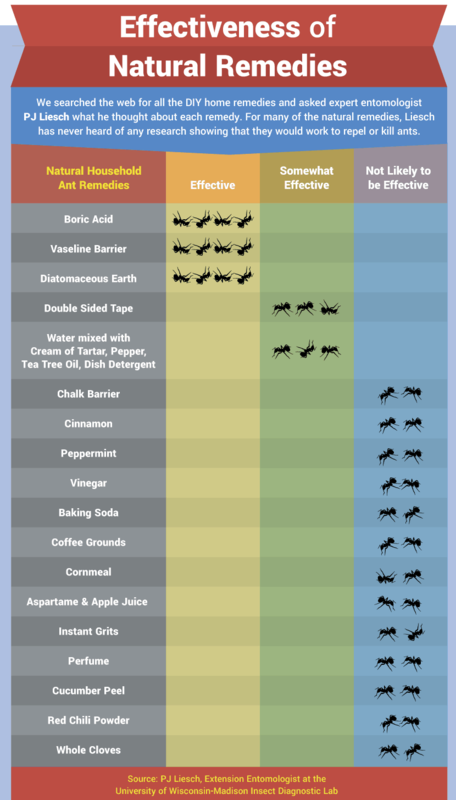 The following is just meant as a general guide to the various ant control methods currently commercially available. Application Methods: Baits contain poison mixed with materials that attract ant foragers. The ants take small portions back to the nest for the queen and other nest mates to eat. The intoxicant must be slow-acting, so ants have time to make their way back to the nest and feed other members. Pre-packaged bait stations should use less than 1 percent of the active ingredient. Do not use bait stations in conjunction with any sprays. Baits with 5.4 percent borate can kill the foraging ants before they reach the nest. Application Methods: Directly spray onto the nest once located. Do not use when using bait stations. Kills the nest and some returning worker ants. Queen could survive if nest isn’t fully saturated. Surviving members of colony could re-establish a new nest elsewhere in your house. 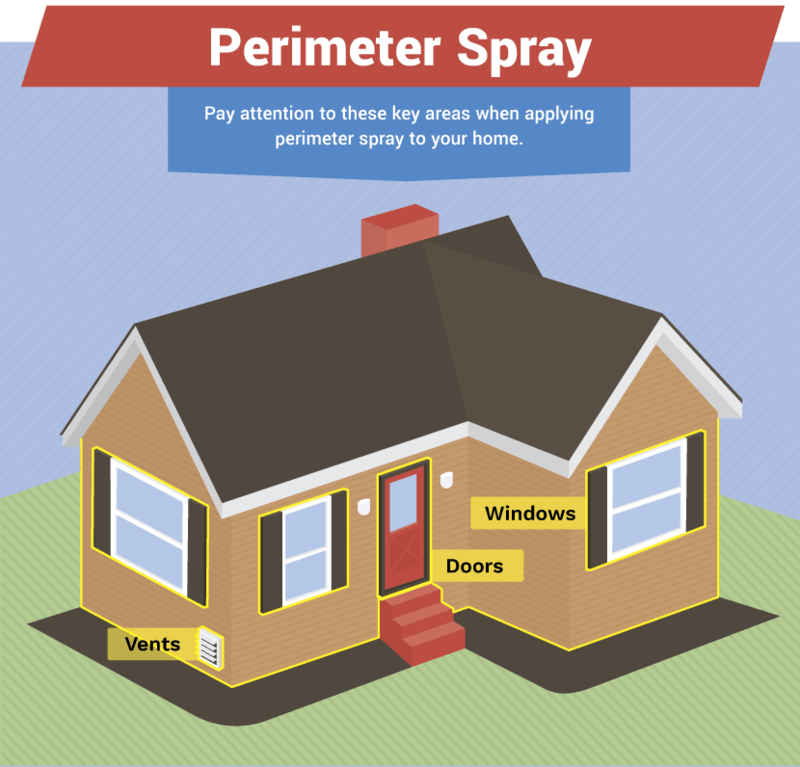 Application Methods: Spray the perimeter around all of your windows, doors, and areas where utilities penetrate to the outdoors. Open cabinets, cupboards, drawers, closets, and doors in areas to be treated. Remove or cover exposed foods, dishes, utensils, food-processing equipment, and surfaces. Remove pets and birds, and cover and turn off air flow systems in aquariums. Remove or cover children’s and pet toys. Cover waxed wood floors and waxed wood furniture in the immediate area surrounding the fogger (newspaper may be used). Close outside doors and windows. Shut off fans and air conditioners, and temporarily disconnect smoke alarms. Turn off all flames, pilot lights, ignition sources, and running electrical appliances that cycle off and on. Call your gas utility or management company if you need assistance. Do not use fogger in a cabinet or under a counter or table. Application Methods: Place traps along known ant routes in your home. Application Methods: See manufacturer’s notes on the product you choose. Most can be dumped into a seed spreader and broadcast evenly through your lawn. There’s certainly no shortage of ant treatment methods out there today that claim to be all natural and to work just as well as poisons. We scoured the web and came up with a list of the most popular ant control methods and then presented them to our expert, PJ Liesch, Extension Entomologist at the University of Wisconsin-Madison Insect Diagnostic Lab. Much to our surprise, it turns out that most of the methods we found have little to no research to support their effect, and may just be myths. Tape, sticky side up: In theory, could work, but tape probably won’t stay “sticky” for very long. Also, if there are lots of ants or other insects, they can walk over their “stuck” companions to cross the barrier. Boric acid: Can be effective, but it depends on how it’s used. Pure boric acid wouldn’t work great. Boric acid as part of a bait can be very effective if used correctly in the correct type of bait. This boils down to a difference in presentation, as the boric acid in the nutrient source (i.e., the bait) will help get the ants to eat it. Vaseline barrier: Could be effective in theory, although you’d need to use a lot of Vaseline, it would be a huge mess, and dirt and debris, etc., would get stuck to it fairly quickly, limiting its effectiveness. Diatomaceous earth/Powdered silica gel: Diatomaceous earth/(DE)/Powdered silica gel can be effective. However, some products can be more effective than others. Professional (pesticide) grade DE and silica gel are designed specifically for controlling insect pests and must be applied appropriately and in the correct location (such as inside wall voids) to be effective. Simply pouring DE around the outside of your home to try and keep ants and other insects at bay isn’t going to work well. Dish detergent mixture: There’s some truth to the dish detergent. Technically, soap solutions can be used as a contact insecticide to kill ants and other insects. Soaps can have insecticidal properties, although each soap brand can have a slightly different formula, so some dish soaps might work while others don’t. To guarantee that this will work, you can actually find “insecticidal soap” at the hardware store or garden center. This is essentially the same stuff as dish soap, except that it’s designed to work best against insects, and lacks the colors, fragrances, and moisturizers of dish soaps. A solution of insecticidal soap must be sprayed directly onto insects to be effective. Once the solution dries, it will stop working. In conclusion, remember our checklist at the top of this article, and follow its steps before anything else when you notice the presence of ants. Properly identify the ant species by contacting your local university’s Cooperative Extension. Use bait stations with slow-acting poisons to eradicate the nest. Create a 2-foot boundary around your home, free from landscaping and vegetation. Keep all food stored in sealed containers. Keep all your floors, kitchen counters, and surfaces clean. Replace any damaged, moist, or soft wood you have in and around your home. Contact a pest management service if you feel overwhelmed. Thank you so much for the wealth of information! I have a customer that has issues with fire ants coming into the house every summer. I’m going to send this to her. There are many things to consider that factors into preventing them. This is a great way to have a handy “checklist.” Thanks again for the helpful post!